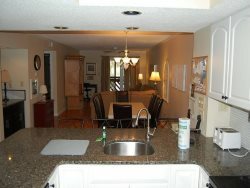 Wireless Internet access is available in these Myrtle Beach vacation rentals so bring your laptop computer and get online. Marvel at the swimming pools; there is more than one. You can even swim in an outdoor pool and an indoor pool that are connected by swimming under the glass wall. The kiddie pool is just right for the toddlers in your family and the lazy river is something that everyone loves. Soak in the hot tub after 18 challenging holes of Myrtle Beach golf and have a little fun in the game room at Bluewater Resort or on the racquetball court. The on-site amenities at this Myrtle Beach rental include a restaurant where you can dine for breakfast or lunch, while overlooking the swimming pool and there is also an oceanfront beach bar, where you can enjoy live entertainment in season. Your Myrtle Beach condo rental at BlueWater Resort is minutes away from Family Kingdom Amusement Park, the Myrtle Beach SkyWheel, Broadway at the Beach and numerous live entertainment theatres. Golf courses, shopping, Sea Doo rentals and fishing charters are just around the corner from this Myrtle Beach resort.